Thousands of boys have come through the doors of the Club for Boys and every one of them has a story. 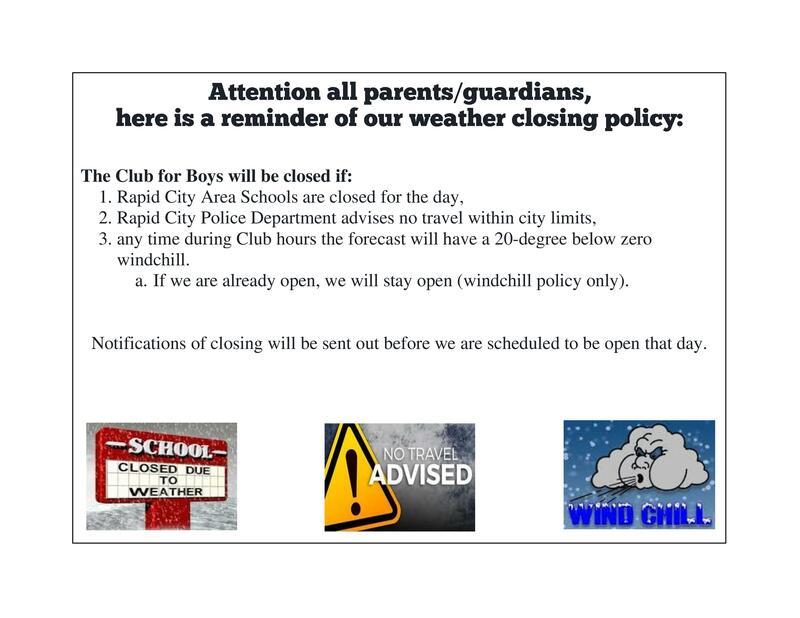 The Rapid City Club for Boys has been a home-away-from-home to thousands of boys for over 40 years. One of those boys is a young man named Bobby. Bobby joined the Club when he was six years old. He came almost daily for the next 12 years. There was no father in his home and Bobby and his mother had quite a few conflicts. Staff helped Bobby to work out difficulties with his mom. At age 16, Bobby made the decision to drop out of school. If he wasn’t going to school, he could not come to the Club. Staff guided him into a local GED program and helped him with his homework. Bobby graduated and received his GED certificate. With renewed self esteem, Bobby got a job at a local fast food restaurant. Now, at age 22, he is an assistant manager and still stops by the Club to see how we are doing. One afternoon, after a nearby meeting, several Club staff went for a soft drink where Bobby was working. Bobby broke into a big smile and was visiting with us when his manager came up and asked, "Who is this group?". Bobby smiled and with a quiver in his voice, said, "These are the guys that raised me!" My Buddy Dave, a Great Memory! Goodness…where do I even begin? First off, I just wanted to say, ‘thank you’…not for taking a few young kids out fishing, hunting, to the Cabin, or even to go get Christmas Trees. Thank you for teaching us young boys how to fish with patience, and to hunt with moral, safety, and sportsmanship. Thank you for taking some boys to the Cabin and teaching them along the way about the outdoors. And last, but never least, thank you for taking two little boys named Rodney and Brandon out to cut Christmas Trees. I didn’t know it then but looking back on it now, that was the day you showed us how to be men. I know it’s been some time since we’ve last spoke or went on an outing together, but I am always going to consider you one of my dearest friends in this unpredictable and changing world. For it was a few select people that gave me the greatest gift a young man can receive. Dave Oyler, thank you again…for giving me the gift of an outstanding role model and how to be a man. "The Club for Boys kept me very busy and gave me a safe place to hang out. I felt accepted and I felt like I belonged. I believe I have the kind of life I do because of all the positive experiences I had at the Club for Boys. Seven boys were attending a Club for Boys winter campout. For one of them, Jason, it was his first experience camping. On this trip, nine-year-old Jason got to do many things for the first time, such as, being away from home and being able to stare up at the night sky and seeing stars instead of city lights. This was also the first time Jason got to go ice fishing and he caught a rainbow trout. Jason have never gotten to experience a coyote call or seen a wild deer until that wonder filled night. It was a truly memorable experience for him. After the boys had a snack of S'mores over the fire -- another first for Jason -- and played a couple of games of Uno, it was getting near midnight. Dave told the boys they had to get ready for bed. All of them did, except Jason, who was just sitting on the edge of the couch. Dave told him he had to hurry up and get ready for bed because in the morning the group was going to get up early and try ice fishing again. He said, "Yes Dave, I know, I will." A few minutes later, Jason was still sitting on the edge of the couch, and Dave reminded him again that it was bedtime. Still Jason continue to sit on the couch. Dave wondered if he might be embarrassed to undress in front of the other boys or was maybe feeling a little homesick. He put his arm around Jason's shoulder and said, "Well, Jason, is there some reason that you are not getting ready for bed yet?" Jason looked up at Dave and said, "This has been the best day of my whole life and I don't want it to end." "The Club had a great influence on me. The staff kept me in school, they taught me to be responsible for my actions and I learned the importance of patience." Kyle was a special needs child that attended the Club on a daily basis back in 1990. He always had a smile and despite his physical and mental handicaps, was always ready to try something new. He participated in everything. A few weeks before school started, Kyle's mom showed us a list of things his school wanted him to be able to do on his own, such as, buttoning his jacket and tying his own shoes. She was having a lot of difficulty teaching Kyle to tie his shoes and asked the Club for help. Richard, a 15 year-old with a giant chip on his shoulder, had been assigned 40 hours of community service at the Club for shoplifting. Richard's attitude was so bad that we gave him jobs that wouldn't involve him with other members. He spent his time cleaning walls, painting benches, and doing other menial tasks. A week before school started, Kyle was at the Club and once again we were trying to teach him to tie his shoes. That same day Richard, who had just four hours of community service left to do, showed up and asked what we wanted him to do. We made him an offer: "If you can teach Kyle how to tie his shoes, we will wipe off your remaining hours and you will be done." Richard was introduced to Kyle, who in his usual manner, gave Richard a hug and a beaming smile and asked, "Are you gonna help me tie my shoes?" Kyle and Richard went to work. About a half-hour later, Richard was not smiling, but Kyle was. He was getting quite a lot of attention from the shoe-tying lesson and enjoyed it. Richard was saying, "No, no Kyle. The rabbit goes around the tree and then down the hole." But an hour later, both Kyle and Richard were beaming ear to ear. "Look at this," Richard said, as Kyle proceeded to tie an absolutely perfect bow-knot. Though Richard's service was done, he stayed for a couple more hours to play games with Kyle. A year later, Richard was still coming to the Club and playing games with Kyle, as well as some of the other boys who needed extra attention. That year Kyle was one of our honor boys . . . as was Richard. "I was able to experience a lot of different activities that I would otherwise have not been able to do"
One day, back in the 1980's, the Club got a call from a resident who asked if she might hire five or six boys to rake leaves. The call came to then Executive Director Dave Oyler, who picked six boys for the job. Since four of the six had never been on a paying job before, he gave them the "Dave Oyler Lecture 101" on responsibility. This "lecture" explained that their work ethic and performance reflected not only on themselves but on the Club for Boys too. Before long the job was done and the resident called, pleased with their work, and asked how much she should pay them. Dave suggested that about five dollars each would be appropriate. When he went to pick them up, they were on the front porch having cookies and lemonade with the homeowner. She said again that they had done a great job and that she would recommend them to anyone. Proud of their efforts, Dave offered up the "Dave Oyler Lecture 202" on saving their money for something they really wanted and not spending it frivolously. The boys were listening, but seeing a sign on the front of a convenience store offering a six-pack of soda for 99 cents, they clamored for Dave to stop. Dave did, figuring the boys had done a good job and if they wanted to spend their money, then so be it. Everyone made their purchases, most using only a part of the money they'd earned, and got back in the van. Everyone except for Louis. Louis stood in the store looking around and Dave told him that if he was going to buy something, he should do it quickly. Finally, Louis walked down the aisle and picked up a loaf of bread, a can of soup, and a half-gallon of milk. Dave asked him if he was sure he wanted to spend his hard-earned five dollars on these items. He looked up at Dave and said, "Yes, I have a younger brother at home and we have no food in the house." Dave watched the clerk, who had tears in her eyes as she rang up the items for Louis, and he pondered his lectures on responsibility to these young men.